Sweden's Social Democrat Prime Minister Stefan Lofven said early on Monday he would remain in office in the coming weeks and called for co-operation across the political divide after an election that showed the country heading for a hung parliament. "We have two weeks left until parliament opens. I will work on calmly, as prime minister, respecting voters and the Swedish electoral system," Lofven, who brought the Social Democrats to power in 2014, told a party rally. He said the results of Sunday's election "are still unclear" but acknowledged that forming the next government could take a while. Lofven's his centre-left party recorded its worst election performance. Preliminary results from Sunday's election had his party receiving 28.1 per cent of the vote, which was estimated to translate into a loss of 13 seats in Sweden's 175-seat parliament, the Riksdagen. The Moderates had 19.2 per cent of the vote and the unaligned anti-immigration Sweden Democrats had 17.9 per cent. Lofven said "a party with roots in Nazism" would "never ever offer anything responsible, but hatred." Sunday's election is Sweden's first since the government in 2015 allowed 163,000 migrants into the country of 10 million. While far fewer than Germany took in that year, it was the most per capita of any European nation. Ahead of the election, promising prospects for the Sweden Democrats had many Swedes worried about an erosion of the humanitarian values that have long been a foundation of their country's identity. "This election is a referendum about our welfare," Lofven said. "It's also about decency, about a decent democracy ... and not letting the Sweden Democrats, an extremist party, a racist party, get any influence in the government." About 7.5 million voters were eligible to vote. About 6,300 candidates sought the four-year terms. The Sweden Democrats — led by Jimmie Akesson — has worked to soften its neo-Nazi image, while helping to break down longstanding taboos on what Swedes could say openly about immigration and integration without being shunned as racists. Akesson responded that state television shouldn't take sides, and later announced that he wouldn't take part in any of SVT's election programs Sunday. At the party's rally on Saturday, he strongly criticized Lofven's government for "prioritizing" the cause of immigrants over the needs of citizens. 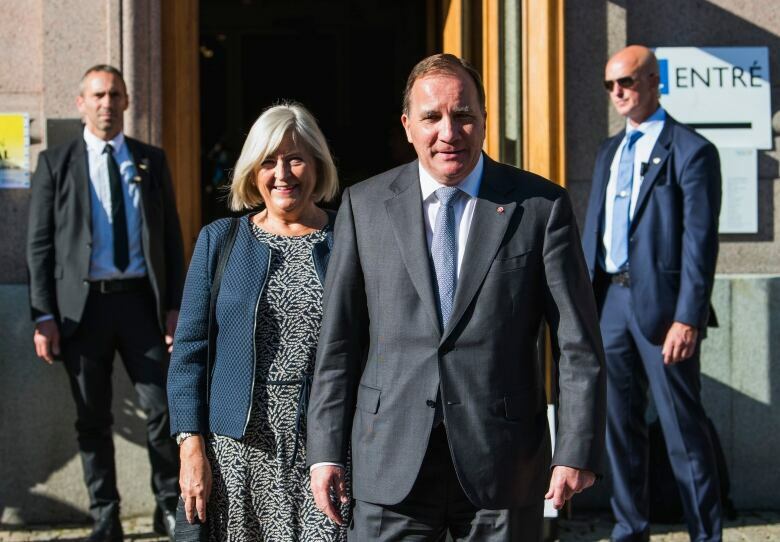 "This government we have had now, they have prioritized, during these four years, asylum-seekers," Akesson said, giving an exhaustive list of things he says the government has failed to do for Swedish society because of migrants.